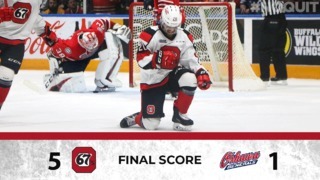 Sunday, December 10th, the Ottawa 67’s will host the Sudbury Wolves at the Arena at TD Place. However, this will not be a regular game for the Barber Poles. When the 67’s score their first goal of the game, teddy bears will rain from the stands onto the ice. You read that right, fans are actually encouraged to throw items onto the ice (items of the fluffy variety that is). This is because December 10th is the annual 67’s Teddy Bear Toss. The team will be donating teddy bears brought to the game to families in need around the city. Teddy bears and stuffed animals of all shapes and sizes are accepted, both new and gently used. The Teddy Bear Toss is an annual event for the 67’s and is a marquee event on their schedule every single year. It is a special moment when that first 67’s goal is scored and the teddy bears poor over the glass onto the playing service. It truly is a sight to behold once all the bears are collected and you see how many bears the community has generously donated to those in need. Get into the holiday spirit and come and donate a bear, there truly is no better way to make a donation than tossing it onto the ice. The most bears that have ever been collected at a 67’s Teddy Bear Toss is 2500. We have high ambitions of surpassing that this year and with your help we can! Don’t have a bear to donate? No worries. The Brick will be at the Arena at TD Place with their Brickley Bears to purchase with all proceeds from the Bears being generously donated to underprivileged children. That’s correct ladies and gentleman, you can make two donations for the price of one. Tickets for the annual Teddy Bear Toss are available by clicking here, calling 613-232-6767 ex. 1, or in person at the Box Office. All minor hockey players part of the 67’s Prospect Program get in for FREE. For more information on the 67’s Prospect Program click here. You can get your tickets for the annual 67’s Teddy Bear Toss here.